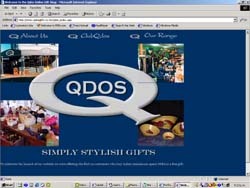 Qdos is a Petone based gift shop selling a wide range of products in the homeware range. The client wished to expand the business by creating an online catalogue of a limited number of products. He also wanted to expand the loyalty program offered via the shop to a wider market. The client also wanted total control over updating of product information on the site. We built a site entirely in Macromedia Ultradev using ASP. While the non product pages are static in content, all information on the products, and categories is fed from a database which the client can update via an online form.